Texting while driving has been against the law in Pennsylvania for the last two years. Since PA's texting ban has taken effect, the majority of police agree that while the law may be good in theory, it is very tough to enforce out on the roadways. Various loopholes in the law make it tough for law enforcement to definitively prove a driver's guilt. The main problem is determining if someone is texting while driving or dialing a phone number, which is not illegal in PA. Drivers are permitted to use a hand-held device to dial up to 10 digits without it being considered texting. Police officers are also unable to look at a driver's phone during a traffic stop to see if it was used for texting. Another loophole permits texting if the vehicle is not moving, so drivers stopped at traffic lights are exempt. These loopholes mean that PA police have written few citations for texting while driving. In the last two years, police have only issued about 2,342 citations statewide, and only six of Allegheny County's 130 municipalities have given 10 or more citations. If drivers do get caught and convicted of texting while driving, they are fined $50, but court costs add an additional $102.50 to the price of the ticket. Some maintain that PA should ban all hand-held phone use by drivers, thereby eliminating most of the loopholes, making the law easier to enforce. In New York State, which has enacted this all-out ban, police issued 55,000 texting while driving citations last year. This is more than 20 times the number issued in Pennsylvania during the last two years. So far, only 12 states plus the District of Columbia have banned all hand-held phone use by drivers. Injured in a Car Accident by Someone Using a Cell Phone? What happens when a distracted driver who is sending a text message slams into you causing serious injury to you or someone you care about? As a result of their careless decision, you are left injured, worried, and confused. You may have had to take time off of work. Your medical bills are piling up. You may be asking yourself, "Do I Have a Case?" To get answers to your questions, call our law firm. 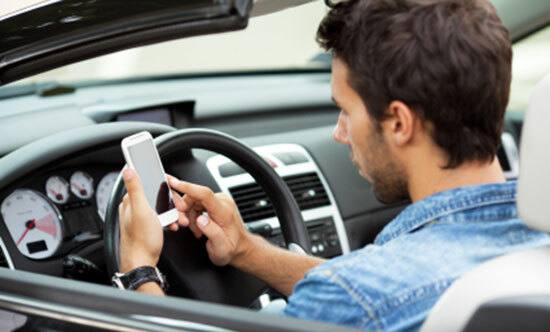 We have experience handling accidents caused by drivers who were using cell phones or driving distracted. You can reach us at 1-866-943-3427, or submit a free legal consultation. Source: Pennsylvania texting ban proves tough to enforce.” April 20, 2014.